Chart Datum. Is the datum system used to represent a position on the globe referenced to a bi-dimensional surface (i.e. the chart). Electronic charts specifically designed for GPS commonly use the WGS84 standard as satellite derived geodetic datum, allowing the acquired GPS co-ordinates to be represented accurately chartplotter’s display. Sources. Quality electronic charts should always be based on official government sources whose hydrographic offices have produced the recognized standard, and the electronic chart manufacturer must have an agreement to use this data. Information concerning the official sources used in producing an electronic chart depends on the area of coverage and is obtainable from the electronic chart manufacturer. E.g. Navionics charts of UK & Ireland are based on official data from British Admiralty. Object oriented technology. Some electronic charts (such as Navionics Gold or Platinum) are produced with a programming technology known as ‘Objected Oriented’. This technique provides specific information to each and every object on the chart, giving the user useful additional information such as light characteristics, wrecks, areas, enhanced data on Points of Interest such as addresses and telephone numbers etc. Detail. Compared to a paper chart, an electronic chart offers many range levels inclusive within a single chart. The user can easily zoom in to show more detail of a smaller area, or zoom out to show a larger portion of the chart with less detail. Navionics charts provide up to 16 different zoom levels; at each step the details shown will automatically be selected in order to give all the necessary information to navigate, while avoiding cluttered screens. Most updated electronic charts should include full detail of spot soundings, bathymetric contours, lights and navaids, wrecks, tide and currents, restricted areas, etc. Seamless charts. The result of the combination of many official charts, of different scales, of different areas, the electronic chart may show clutter, holes or unaligned elements (e.g. depth contours) if the overlap of the component charts is not perfect. Navionics is the only manufacturer applying “Full Seamless Technology” to avoid these type of mistakes both vertically and horizontally, resulting in clearer charts with no interruptions. Photos, 3D views and other special features. Top-of-the-range electronic charts are now starting to embed additional information, that can improve situation awareness and facilitate the navigation and approach to a port. Among these features, top-down and panoramic photographs, 3D models, pilot books are available for most navigated areas worldwide. Navionics Platinum, launched in 2005, was the first product to bring these new features to the market. 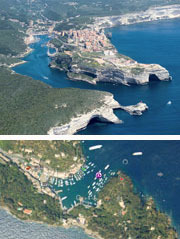 Launching at London Boat Show 2008, the new “Platinum+” cartography now provides extremely high-resolution satellite and aerial photography overlays, stunning XGA panoramic photographs, and improved 3D imagery providing high definition rendering of depth elevations and seabed. Coverage areas. Until a few years ago, electronic charts covered relatively small areas on one media (memory card). Nowadays, thanks to the removal of memory constraints by using standard cartridges such as CF (Compact Flash) or SD (Secure Digital) media, it is possible to include huge coverage areas on the same chart, at very competitive prices. The detail of a wide coverage chart (e.g. Navionics 23XG, covering all of the Mediterranean including Black and Caspian Sea) is exactly the same excellent detail provided on a Small chart. It’s always worth checking the price/coverage ratio of an electronic chart: bigger “cuts” are generally much more convenient!